. . . everyday spaces . . . in motion/transit/stasis . . . ambivalent . . . without belonging . . . 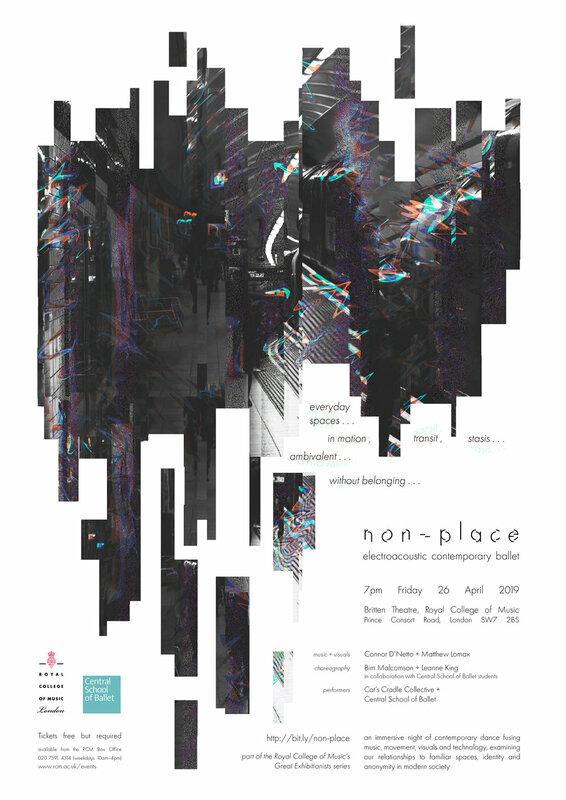 Conceived by composers Connor D’Netto and Matthew Lomax and inspired by the ideas of French anthropologist Marc Auge, non-place creates an all-encompassing experience bringing together over 30 dancers from the Central School of Ballet, expansive visuals, and a new collaboratively composed score featuring 15-piece chamber orchestra and lush live electronics. Connor D'Netto has been described as "the model contemporary Australian composer" by ABC Classic FM. His music balances rhythmic drive, heartfelt lyricism drawn from his background as a classical singer, textures expanding the limits of instrumental sound, and delicate incorporation of electronic elements. Connor’s music has been commissioned across Australia and abroad, including by the likes of the Melbourne Symphony Orchestra, Australian String Quartet, Goldner Quartet, Mivos Quartet, Katie Noonan, Karin Schaupp and Claire Edwardes. In 2019, Connor was announced as the Composer-In-Residence of the 2019 Australian Festival of Chamber Music, making him the youngest in the Festival’s 29-year history. He has also held residencies and fellowships with prolific New York new-music collective Bang On A Can in 2017 and with the Melbourne Symphony Orchestra in 2016. Connor has been awarded prizes including an APRA Art Music Fund Award 2018 and the Australian New Works Award 2015. As a performer, Connor is one half of We Are Breathing alongside American cellist Ben Baker, creating lush electroacoustic soundscapes fusing contemporary classical, improvisatory, electronica, and post-rock influences. Connor is the artistic director and co-founder of the Brisbane-based concert series Argo, creating immersive experiences fostering creative collaborations between artists of various mediums. Currently Connor is studying his Masters of Music as a Tait Trust Scholar at the Royal College of Music in London, and holds a Bachelor of Music with First-Class Honours from the University of Queensland. Matthew Lomax is a Sunderland-born contemporary classical and electroacoustic composer. noise | silence | density | space | motion | stillness. During his initial studies in composition close to home at the Sage Gateshead’s Centre for Advanced Training, and through the exploration of computer-based composition at the University of Manchester, Matthew developed a musical language that incorporates the physicality and sonic qualities of natural phenomena, visual arts, and architecture to create a tactile and dramatic musical experience. Matthew's early pieces were premiered in the Vaganza festival and Classical Evolution concert series during his undergraduate at the University of Manchester, and collaborations with the Association Recontre Arts Musique - supported by the Bliss Trust. This language translated into his acoustic music too, such as the RCM’s Composers Studio work ‘Mesospherics’ for mixed ensemble which traces the journey of volcanic ash from inside the Earth to the outer edges of the atmosphere. Recent projects include ‘How the Great News was Received’ for string quartet and harp, written for the RCM’s ‘Passing Youth’ WW1 Centenary concert; 'Insectivorous' for chamber orchestra, and 'Drowning in the Din...' for Bass Clarinet, Bass Guitar and Electronics, premiered at the Royal Academy of Art's 'RA collection' concert. Future projects include pieces for guitar and viola, and another for four sopranos as part of the RCM Contemporary Music in Action concerts. The Cat’s Cradle Collective takes its name from one of the oldest games in recorded human history - the cat’s cradle. Using simply one string — alone, in pairs, or in groups — across times and cultures, humans have created figures, invented stories, and let their imagination soar. As a collective, we aim to create performances based on that sense of intimacy, timelessness, playfulness and freedom of imagination, across players and audiences alike.